If you are experiencing sudden, intense pain in your abdomen or groin that you suspect may be a hernia, contact your doctor immediately or visit the Emergency Dept. This site is not intended as a substitute for professional medical care. Only your surgeon can diagnose and appropriately treat your hernia. NICE Guidance states that surgical hernia repair 'should be undertaken in most individuals presenting with an inguinal hernia' and this is also similar advice to the Royal College of Surgeons (RCS). However, the Clinical Commissioning Groups (CCG's) in charge of the provision of herniorraphy/hernioplasty techniques within your own UK health boundary do not always follow national guidelines. A report by the Hernia Outcomes Group state that over half of CCG's in England are reducing access to hernia repair surgery. This invariably results in longer wait times (2017 is 40% higher than 2016 according to NHS statistics reported in The Guardian newspaper). In the recent Royal College of Surgeons report entitled 'Is access to surgery a postcode lottery?' 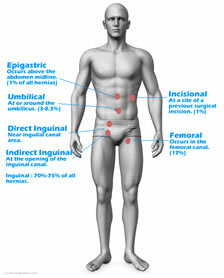 the somewhat variable policies of Clinical Commissioning Groups (CCG's) to Inguinal hernia surgery were measured. There was wide variance between the Royal College of Surgeons (RCS) guidance that states that 'surgical repair should be offered to all patients presenting with symptomatic hernias'. The report found that only 27% of CCG's surveyed comply with RCS / NICE guidelines. Some CCG's require a hernia size increase or incarceration history before they will consider surgery;a policy with potential issues for risk and surgical outcome not to mention patient discomfort. Below is the complete list of CCGs in NHS England and their policy (if any) at time of writing (March 2015). We invite customers to help us complete the columns if you know the policy in your area to help other people. Thank you! Grampian Rationing introduced for Orione Hernia Briefs. We invite customers to help us complete the columns if you know of the policy in your CCG area. This will help others make informed decisions.